NEW DELHI, India – February 14, 2017 – One of the world’s leading laptop cases and accessories makers, Targus® Inc, recently introduced their TURBOQUAD 24W USB Travel Charger – Fast, Multiple, International and BIS Compliant. The charger provides 4.8A total charging power across four USB ports. With 5 interchangeable AC plugs, the charger brings utmost convenience and perfectly fits any travel plans. The Smart Detection on each USB automatically detects the exact charge required by the connected devices and delivers maximum charging speed accordingly. “The usage of multiple USB devices amongst commuters and travelers is growing. Carrying a smartphone or a tablet, portable speakers, headsets or fitness trackers, most users want to be able to charge their devices simultaneously, ideally from a single charger and a single socket. The Targus TURBOQUAD offers this ultimate convenience. It can charge up to three full-sized iPads at once or two iPads and two smartphones. Featuring a Smart Detection function, a palm-fit design and with 5 interchangeable AC plugs, this charger is a most useful gadget to carry around. It brings to an end getting disconnected from work, relatives and overall communication due to drained batteries.” said Mr Manish Aher, Director of Product Marketing and Country Manager, India at Targus Asia–Pacific. “Targus TURBOQUAD is BIS certified, featuring the 3-pin AC plug as per Indian Government norms and regulations.” further added. 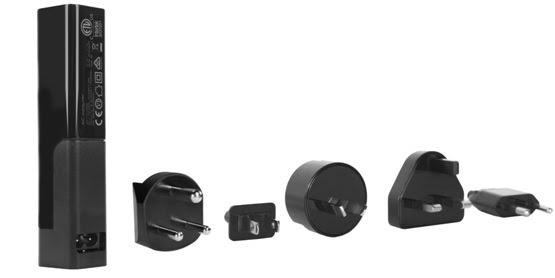 5 interchangeable AC plugs and suitable for multiple countries. With this feature, the Targus TURBOQUAD USB Travel Charger is ideal for business and leisure travel. The charger and plugs can be conveniently stored in a protective carrying pouch. The 4-port version is best suited to charge multi devices and supports 2.4A fast charging. The Smart Detection feature allows it to recognize your device type and to deliver the optimum charge from single outlet to each by ensuring that the available power is distributed in the best possible way. The Targus TURBOQUAD USB Travel Charger is designed to fit into your laptop bags, travel case, handbag and even in a small pouch. Targus® created the mobile accessory category with its invention of the laptop case over 30 years ago. The company continues to advance the mobile accessories category with innovative and relevant solutions for today’s lifestyle. Targus products enhance productivity, connectivity, and security, liberating consumers to use their mobile devices in any and all environments with the utmost convenience and comfort. Founded in 1983, Targus’ headquarters are located in Anaheim, Calif., with offices worldwide and distribution agreements in more than 100 countries.